English chemist and educationist; born in London March 2, 1864; educated at University College School, at Owens College, Manchester, and at the universities of Paris and Heidelberg; B.Sc. of Victoria University, Manchester, and of the University of London. He worked under Berthelot in the laboratories of the Collège de France till 1889. In that year he was elected to a Bishop Berkeley Scholarship at Owens College, and in 1891 and 1895 to assistant lectureships in chemistry at the same institution. In 1895 Hartog became lecturer to the university, and in 1901 he was appointed member of the court of the university. Hartog's work lies chiefly in the field of thermo-chemistry; and he has published the results of his investigations on the thermochemistry of the sulfites and of iron nitrid, on the flame spectrum of nickel compounds, on the latent heat of steam, etc. He has also written most of the articles on chemists in the latter half of the "Dictionary of National Biography." He edited a history of Owens College on the occasion of its jubilee in 1900. 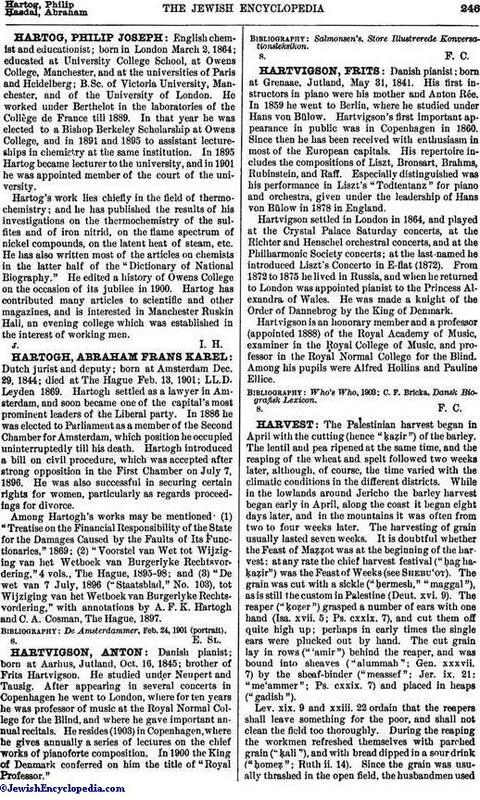 Hartog has contributed many articles to scientific and other magazines, and is interested in Manchester Ruskin Hall, an evening college which was established in the interest of working men.